Molde town picks on a different personality at night as streets are left deserted as early as 8pm. Whatever happens indoors can only be left to the imagination, but Panorama’s team braced the harsh autumn storm on Friday night to one of the student’s housing for a taste of pre-party student nightlife. (Student nightlife in Molde – Part 1): Glombo student residence, one of our night pit stops invited us with a steady beam of excitement. 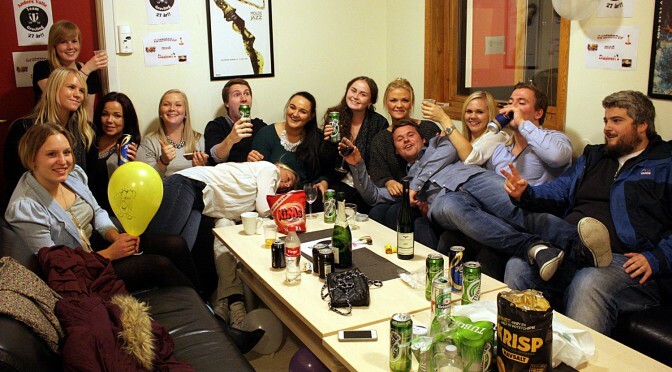 Anders Vatle, a logistics bachelor student, happened to be celebrating his surprise birthday party that was meticulously hosted by his close friends at the residence living room. The pop music that filled the air seemed to play to infinity. It is common knowledge that where there is a party, there is alcohol. Like Panorama on Facebook and get the latest news. As is the case in Norway, most parties begin with a drinking session called vors (editors note: short for vorspiel) which is a small get together of friends before heading out to the clubs, while conversing among them and playing a popular card game called Bussruta. “The cards are placed on a table in a pyramid manner and any player who looses in each row drinks a certain number of beer cans or shots depending on the order of the game. The higher the pyramid loss, the more drinks one has to take,” said Lasse Lærum, a third year bachelor in logistics student. See videoclip from the pre-party. In such a cut-throat academic environment, students usually study for four to five nights a week and then take a day or two to cool down, but they will make one night count. “We do have several weekend pre-parties in our residence quite often, but today some of us cannot drink because we are having exams. We can only have Pepsi and water,” said Caroline Storhaug, a nursing student. This statement counteracts many who believe that partying means getting drunk. Most students try to find a party to go to. If there is a party going on somewhere, everybody goes there. Progressive social drinking which is held in private residences, normally as a pre-party, is advertised on Facebook. It is cheaper to buy six packs of beer or get a bottle of liquor and share it in private, than to buy drinks at pubs, clubs or restaurants. Needless to say, big nights out are influenced by the number of bars within walking distance. Vallhall – located on Molde Campus – is popular. The other two popular student hotspots are Bar Alex and Kompagniet, which will be our next focus in the clubbing section of our nightlife exclusive. Although partying with a couple of friends over a couple rounds of beer can be a blast that most students look forward to, the subject of alcohol consumption among students remains murky.